Delete the mappings on data projects which build upon the data entities to be refreshed (this is required for step 2). Delete all the data entities from the Data entities list which are software updated. 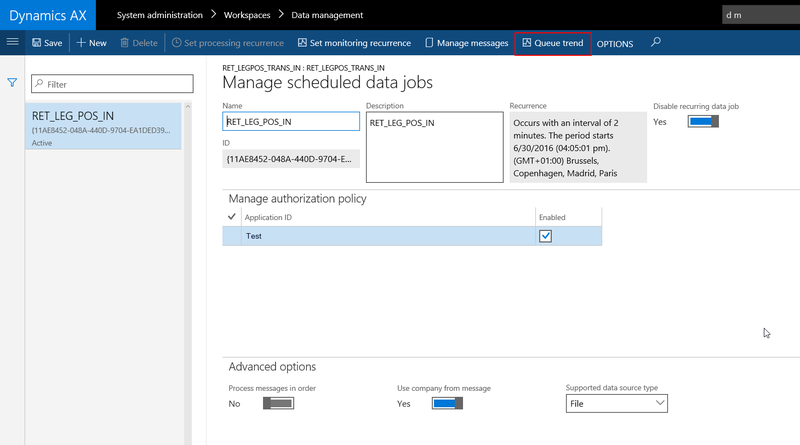 Now refresh data entities through System administration > Workspaces > Data management > Framework parameters > Refresh data entities. The deleted entities will re-appear. Re-create the mappings w you deleted earlier. Most DEV environments and even TEST environments will be based on OneBox installations. This is either a local VM with all AX7 components running on premise through Azure authentication or similar VM hosted on Azure. 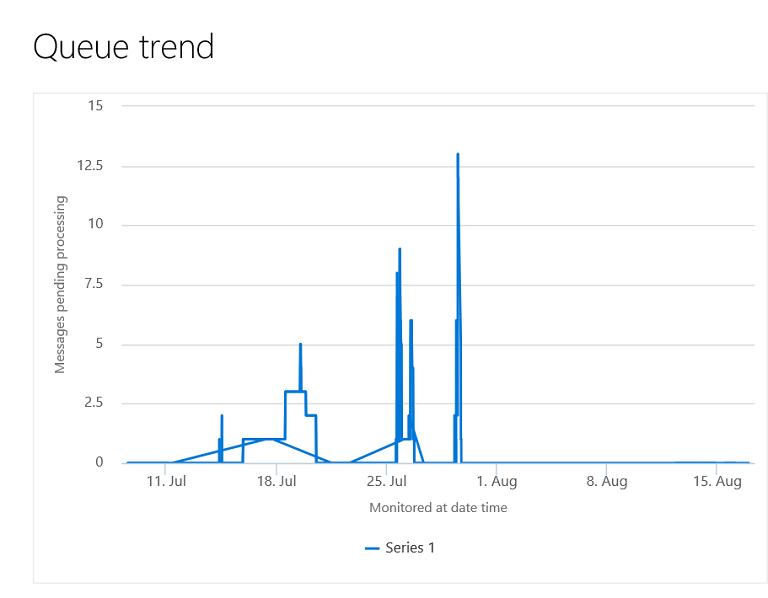 The differences in behavior between these SQL Server OneBox environments and Azure SQL powered Public Cloud environments are decreasing by the minute due to bug fixes and general advancements. But, be careful here. Do not expect that your Public Cloud environment will 1:1 behave like your TEST environment did before. 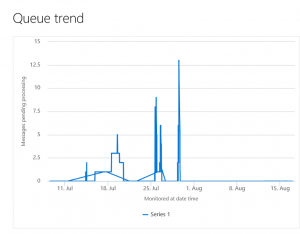 Be on the safe side and reserve some time and budget for regression testing when taking the step from TST to UAT environment. I’ve seen SSIS errors on Public Cloud environments which never occurred in a TEST environment. It seems obvious to leverage the out-of-the-box SQL change tracking capabilities when only updated or new records are to be shipped. It also seems obvious to implement business logic at interface run time. But do not make these decisions too quickly. Weigh all the pros and cons of the different options as there are more options with the framework than you think. 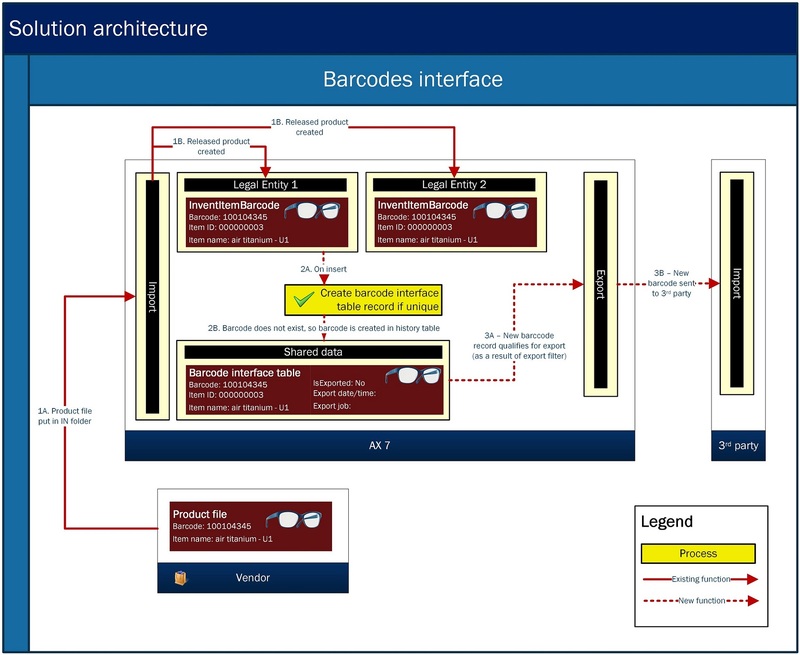 For example, in my project I faced a scenario in which it was a requirement to ship out all unique AX7 barcodes to a legacy system. So all new unique barcodes were to be gathered from a multi-company situation (barcodes are company-specific) and additional business logic was needed to gather additional information. I could have leveraged SQL change tracking and implement outbound business logic. But that would have made the interface fairly slow. Instead, I implemented business logic on event basis: whenever a barcode was inserted, business logic evaluated the cross-company uniqueness of the barcode, gathered the additional meta data and inserted this data into a custom interface table when evaluated positively. The result: fast interface export. • It requires a minimum of 3 clicks to retrieve the cause of an error. 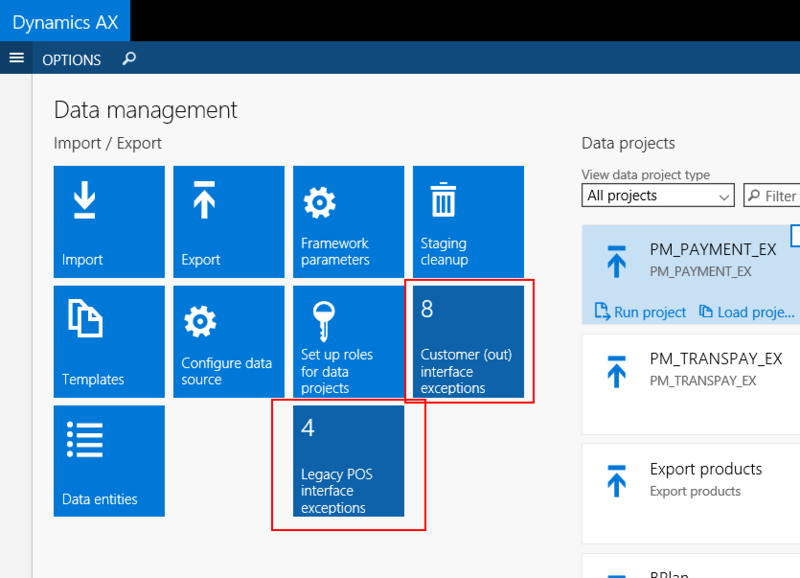 • There’s no form in the AX7 Data Management area which allows for creating personalized tiles to show interface exceptions. The list does not show the number of records in the source file, so it is difficult to identify source to staging errors. The list only shows the status for the data job run as a whole, but often a job run concerns multiple data entities, which all have their own individual status. • It is not possible to retrieve the original file name in case a file has been uploaded through the Data Management API. Therefore, it is not possible to trace an (erroneous) data job run back to the original uploaded file. So in case an exception occurs, a tile highlighting interface exceptions will show value 1 or higher after refresh. This is the trigger for a system administrator to take action. A click on the tile will directly show the exception in the interface form. By the meta data in the form the system administrator will have a good sense about a possible cause, so he can perform a direct click to the relevant error log (execution log or staging table log). So it will only require 2 clicks to inquire the cause of any error. The challenge here then is to get the number of exceptions down to 0 again after fixing the issue and re-running the respective data job.. ;-). 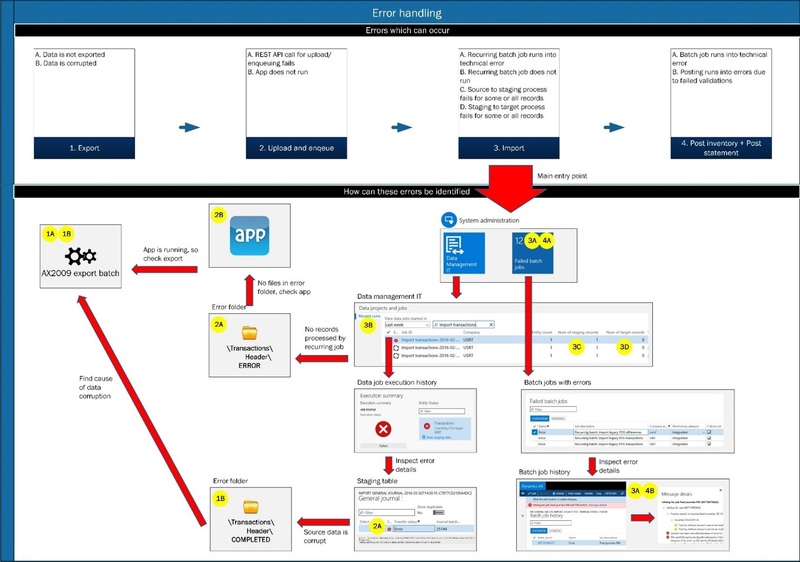 Some of you might question why it would be needed to set Skip staging to false on a data project – In other words: to utilize the staging table in an outbound interface process. Well.. it is a requirement if you need to run business logic in your outbound interface. Inbound processes perform validations against standard or custom AX7 business logic. In case of errors, the respective staging record goes into error status and import for the particular record is withheld. In outbound processes, custom business logic may put the record into error status, but the export is NOT withheld. AX7 is designed to output the records AS-IS, independent from the status of the record in the staging table. Implement business logic to validate your data for output as you’d do in an inbound process. So promote your staging records to the status as required. Implement a routine to delete all the staging table records which are in error state. This will ensure only records which pass your validations are outputted (if you want to allow any output in case of errors). 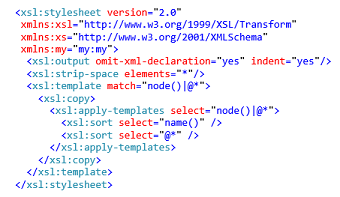 Transform root node and main child node names to reflect the required XML schema. 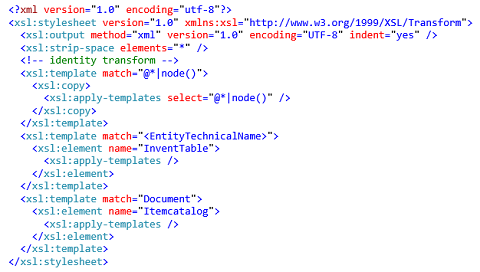 In this example the root node “Document” is transformed to “ItemCatalog” and the child node “<EntityTechnicalName>”> is transformed to “InventTable”. When I architecting the various interfaces in my project, I was very keen on including value conversions, default values and other transformations in my data project mappings to provide some flexibility for future adjustments. However, I started to lose enthusiasm when I found out that default values and conversions were not allowed for enums. I even decided to completely push all possible transformations to 3rd party systems when I found out that mappings cannot be migrated at all. Background here is that with every update on a data entity, you might have to do a lot of manual re-mapping across different environments (DEV, TST, UAT) – see learning 1 above. Therefore, I’d advice (for now) to reduce the use of sample files (non-auto column mappings), default values, transformations and value conversions to a minimum. 8. Be careful with LOAD PROJECT! • In case of a component entity, using the Load Project feature will have your child entity mapping removed from the mapping if the child entity is not in the upload file. 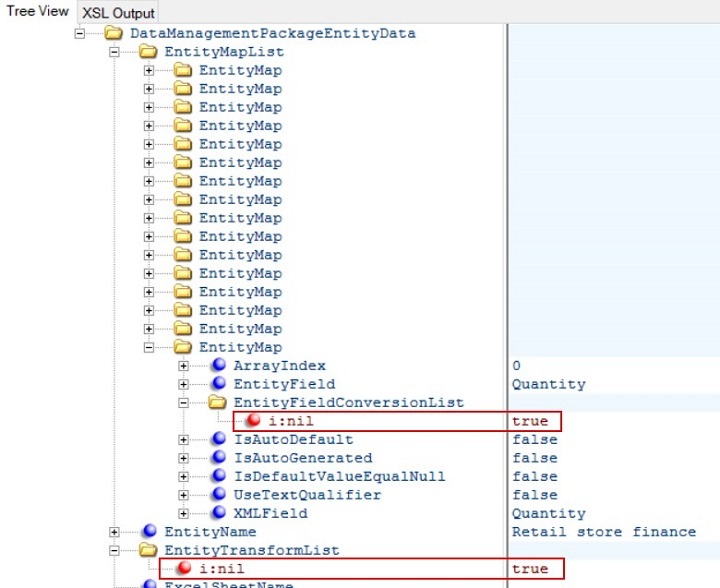 • If you deleted an auto mapped column from the interface mapping on purpose, the deleted mapping will have been re-created automatically if you upload the file through the Load Project feature. • The Load Project feature will cause a mapping for a particular field to be removed if the field was originally mapped but no longer exists in the source file uploaded. • Only allow system administrators who know what they’re doing to run interfaces manually through the LOAD PROJECT feature. a. The Run Project feature. b. A setup which allows users to drop files in folders which are uploaded and processed through the Data Management API. 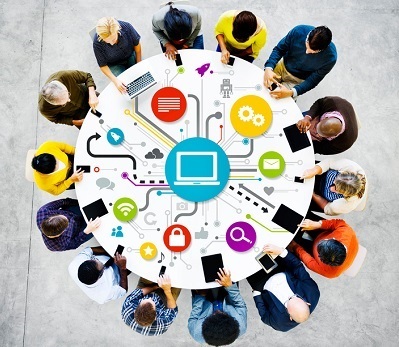 By enabling the processing monitoring job on the Recurring data job.. While architecting interfaces it is important to be aware of the relevance of the difference in scope of data between a data entity and its staging table. For example, you may choose to include additional tables and fields for filtering on the data to be exported, but you may not want to make this data available for export.